Volunteers and Minnesota Landscape Arboretum Gardener Erik Lemke used a gas powered trimmer, rakes, and tarp to move switchgrass tops to the compost pile on May 9, 2018. The other grasses were burned May 2nd before new growth started. Perennial ornamental grasses, once established, can be one of the easiest plants to grow in your garden. And spring time may be the only time when you'll need to give them a bit of attention. Take a good look at your plant. Is the center of it dead? Large mature grasses with a dead center can particularly benefit if they're divided in the spring. You don't have to divide ornamental grasses (digging up the plant and cutting it into smaller sections, each with stem and roots). This can be a major job--depending on the grass, and it often requires a strong back and a sharp spade. the grass just hasn't done very well or it's declining and has few flowers. Calamagrostis ×acutiflora 'Karl Foerster' can successfully be divided in the fall, but most other grasses respond best to spring division. Division is the most common method of propagation for ornamental grasses. In late winter or early spring, before new growth starts, cut back grasses to the ground to remove the previous year's growth. If the plants are not cut back, spring growth can be delayed and large plants will look unattractive (half dead) throughout the year. Manual trimming with an electric hedge trimmer works well for small areas. Large areas can be burned, if permitted and closely supervised, or mowed. 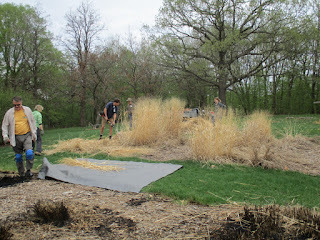 In our research, the grasses were burned to the ground, usually in April. 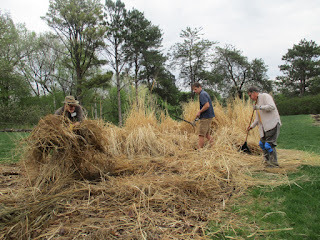 Some cool season grasses and sedges may be semi-evergreen such as Deschampsia, Festuca, Helictotrichon, and Carex 'Ice Dance,' and should be carefully cut back or any dead foliage and flowers removed with a rake or by hand. Burning cool season grasses may be fatal. Calamagrostis ×acutiflora 'Karl Foerster' begins to grow very early in spring and can be cut back in March or early April. 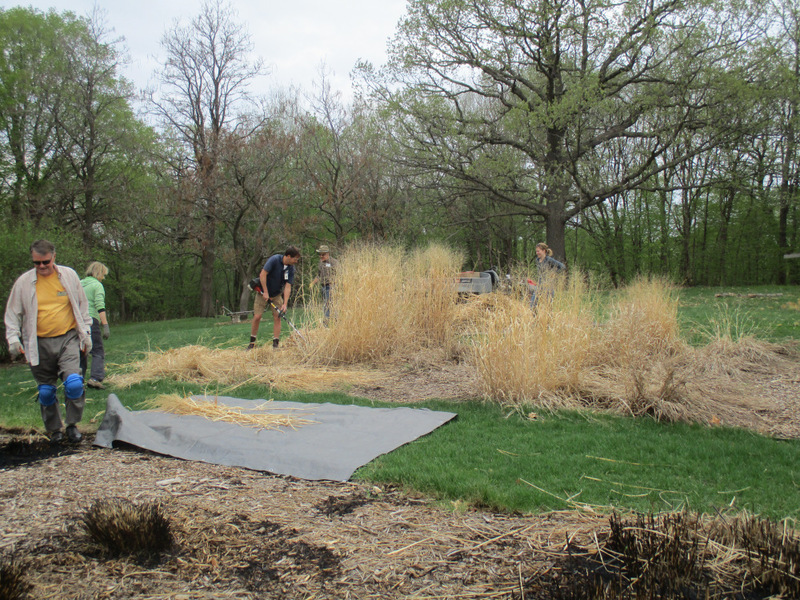 2018 is the second year we have cut back some of the native grass tops in the grass collection at the Minnesota Landscape Arboretum instead of burning, in hopes of minimizing damage to insects like butterflies and moths that may have overwintered in the plant bases. Cutting back grasses in the fall, especially younger plants, may result in winter injury and the beauty of the plants in the winter landscape is lost. Trimming plants to 1–2 feet can be a compromise to maintain a tidy appearance and still hold leaves and snow for winter protection. This article includes excerpts from Mary Hockenberry Meyer's "Grasstalk" blog on 5/11/18.